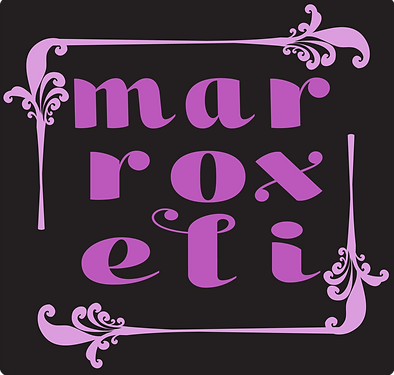 I am happy to present my first ever guest post from my Worn Through colleague and one of my dear friends, Monica D. Murgia. Monica has an MA in Fashion & Textile Studies: History, Theory, Museum Practice from FIT. Her focus was curatorial, with an emphasis on twentieth century fashion designers. Her current research interests surround American fashions from 1935-1965, artistic collaboration with fashion designers, and current technological innovations that impact the fashion system. Monica has also taught several courses in fashion design, focusing on history of costume and the creative process. She writes about teaching fashion at Worn Through, and explores the relationship between fashion and art on her own blog. Be sure to follow her on Twitter and to like her on Facebook! 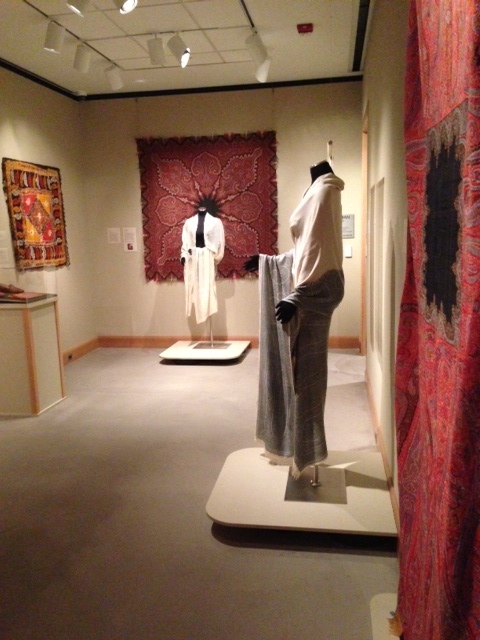 A few weeks ago she visited the Allentown Art Museum exhibit, The Paisley Pattern: Woven Shawls from Asia to Europe, and knowing about my passion for Indian and Kashmiri shawls — I did an entire chapter about them in my master’s dissertation — kindly offered to do this guest post for me. I recently went to see an exhibit on Franz Kline at the Allentown Art Museum. After taking in that show, I wandered around the other galleries in the museum. Much to my delight, there was a wonderful exhibit on textiles. The Paisley Pattern: Woven Shawls from Asia to Europe was a small show, but expertly done. The show’s focus was specifically on woven shawls. These objects were prized possessions during much of the 19th century. Fashion moved at a much slower rate. Clothing was not disposable. Garments had to last years, and were passed down. Because of this, many garments had to be made of conservative colors. Shawls and scarves added variety and flair to a wardrobe. 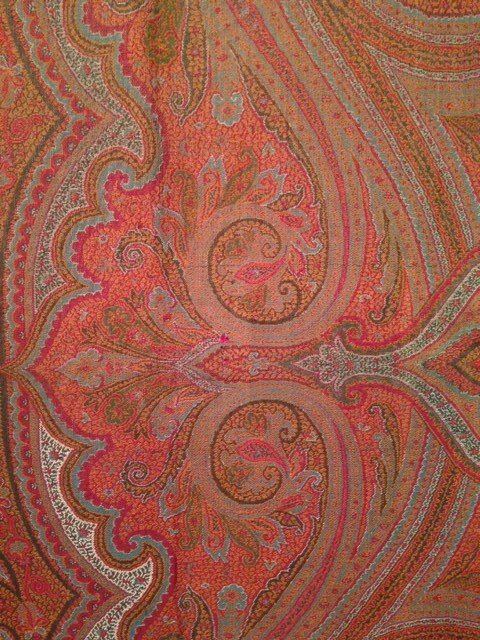 Paisley shawls from Kashmir, India were the most sought after. Kashmiri shawls were meticulously crafted with the best fibers, dyes, and weavers. The shawls were woven in sections on small looms by several weavers. Once the sections were complete, they were stitched together to create the final product. These paisley shawls were worn by upper class Indian and Persian men. However, Dutch and British colonization of India introduced Europeans to Kashmir shawls. The exotic and beautiful patterns caused an immediate fashion craze. Textile manufacturers throughout Europe started to replicate these patterns on jacquard looms. Jacquard looms are mechanical looms that can create complex designs with the use of punch cards. These punch cards controls a series of operations in the weaving process. France and Scotland became major mass producers of paisley designs via jacquard looms. This mass production made paisley more accessible to the middle class throughout Europe. Shawl, 1840. France or Scotland, maker unknown. Detail at beginning of post. The exhibit showed some wonderful examples of real Kashmir shawls and those that were produced abroad. 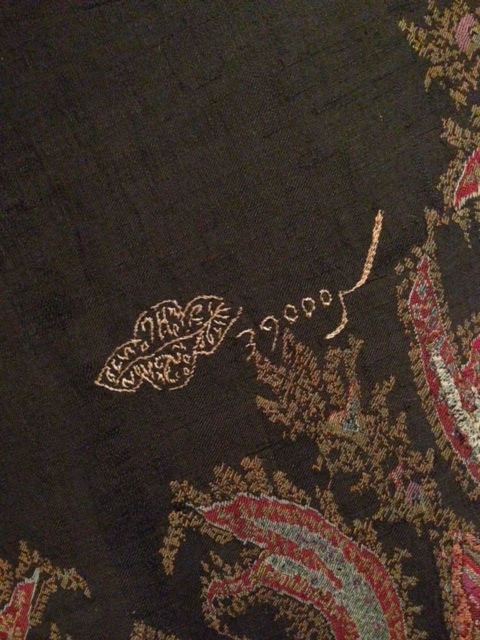 A favorite detail of mine was on a shawl from 1870. The embroidered signature of the workshop is visible. 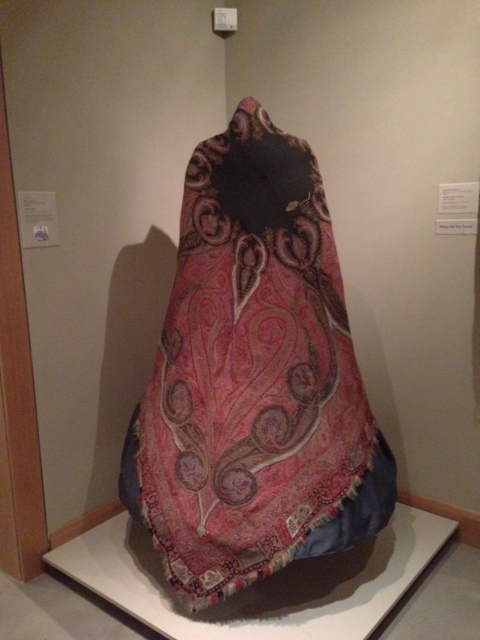 Paisley shawl, 1870. India, Kashmir, maker unknown. The shapes of the paisley shawls manufactured in Europe also changed. In the 1850s, the shawls were long and rectangular. This was to accommodate for the crinolines (hooped petticoats) and full skirts that were fashionable during this period. As the bustle replaced the crinoline, shawls became square. The change in silhouette meant that there was less to cover, hence smaller shawls. Americans coped with lack of access to paisley prints by embroidering them onto shawls and scarves. 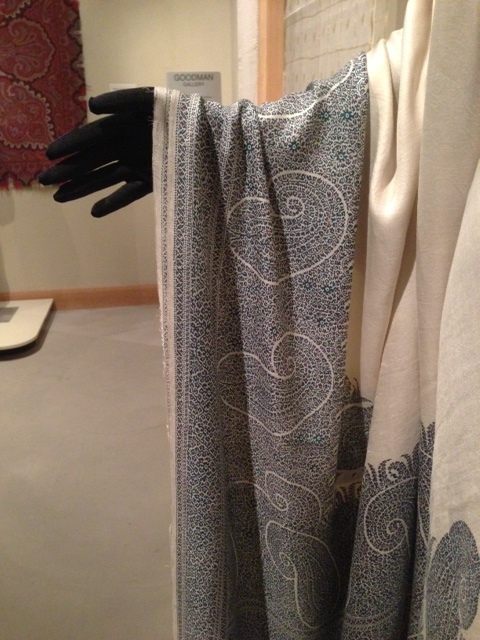 The museum had several great examples of paisley motifs embroidered onto white muslin scarves. I was really impressed with the wall text and featured textiles. The curator explained such a complex history in a way that was easy to understand. The selection of objects really reinforced the main points. The paisley on display was so dazzling. The complexity of design, use of color, and the skill of embroidery were on my mind long after I left the exhibit. It’s amazing how well-made items can last such a long time. Seeing how these shawls survived 150 years (or more) makes a wonderful case for sustainability. All of the scarves and shawls are still stylish, even now. I would love to own something so well-made and so beautiful. Knowing that well-made fashion and accessories can last several lifetimes says it all: Quality over quantity.